American Silver Eagle coins are available from the United States Mint annually with three options. All of the coins in the Silver Eagle Series consist only of a 1 oz silver option, but the coins are produced as investment-grade bullion coins, collectible proofs, and unique burnished coins. Right now, 2019-W 1 oz Proof American Silver Eagle Coins are available to purchase online from JM Bullion in perfect condition. Arrives inside of the NGC protective plastic slab! 33rd available year for Proof American Silver Eagles! Limited availability of perfect condition coins! Features an Early Release label. The obverse face of the coin features Walking Liberty. On the reverse is the heraldic eagle of the United States. Includes a W mint mark from the West Point Mint. Each 2019-W 1 oz Proof American Silver Eagle Coin in this product listing is available to purchase as a perfect specimen. The PF70 certification from the NGC indicates the coins exhibit full, original mint luster with no detracting flaws of any kind. The included UCAM label stands for ultra-cameo and means the coins have strong, frosted design elements with deeply-mirrored, clear background fields. 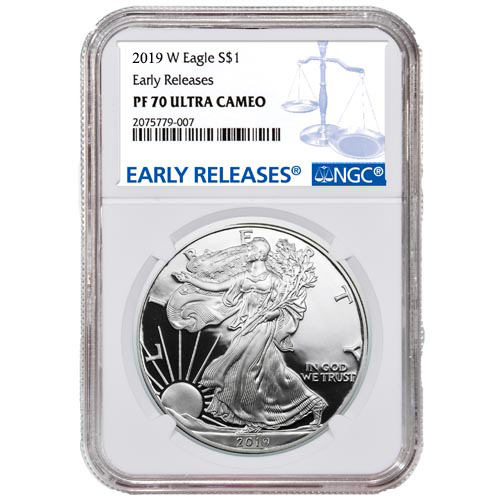 The Early Release label included inside of the NGC slab means the coins arrived within the first 30 days of the US Mints issue of 2019 Proof American Silver Eagle coins. All Proof American Silver Eagle Coins feature mint marks from the US Mint. The West Point Mint strikes all Proof Silver Eagles and engraves a W mint mark on the reverse. On the obverse field of all 2019 Proof American Silver Eagle Coins is the design of Walking Liberty. Designed in 1916 by Adolph A. Weinman, the image first appeared on the Walking Liberty Half Dollar between 1916 and 1947. The image depicts Lady Liberty walking toward the horizon as the sun crests over a mountain. The reverse side of 2019-W 1 oz Proof American Silver Eagle Coins features the heraldic eagle of the United States. The design includes an American bald eagle behind the national shield as it clutches the olive branch of peace and the arrows of war. Also included is a triangular cluster of stars above the eagles head that includes 13 stars representing each of the original colonies that formed America following independence. If you have any questions, JM Bullion customer service is available to help you out. Our customer service team is available to you at 800-276-6508, online using our live chat, and via our email address.